Despite at times being seen as having a narrow focus, labour history is about more than trade union records, or strikes and lockouts, or left organisations (though it is of course about all those things). There is a growing appreciation of studies of work, family life, leisure, class (in both town and country) and ethnicity involved in labour history. 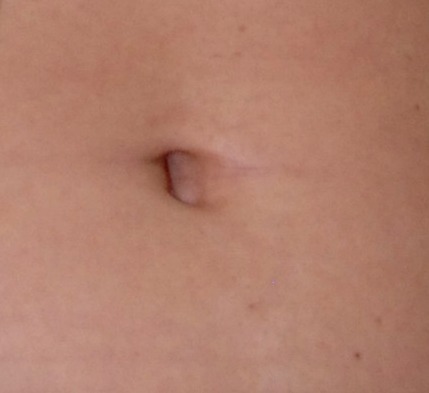 These sites will give you some idea of this. As with most things on the internet, some have links that will lead you to even more interesting sites, and others have links that will lead you nowhere. Help! 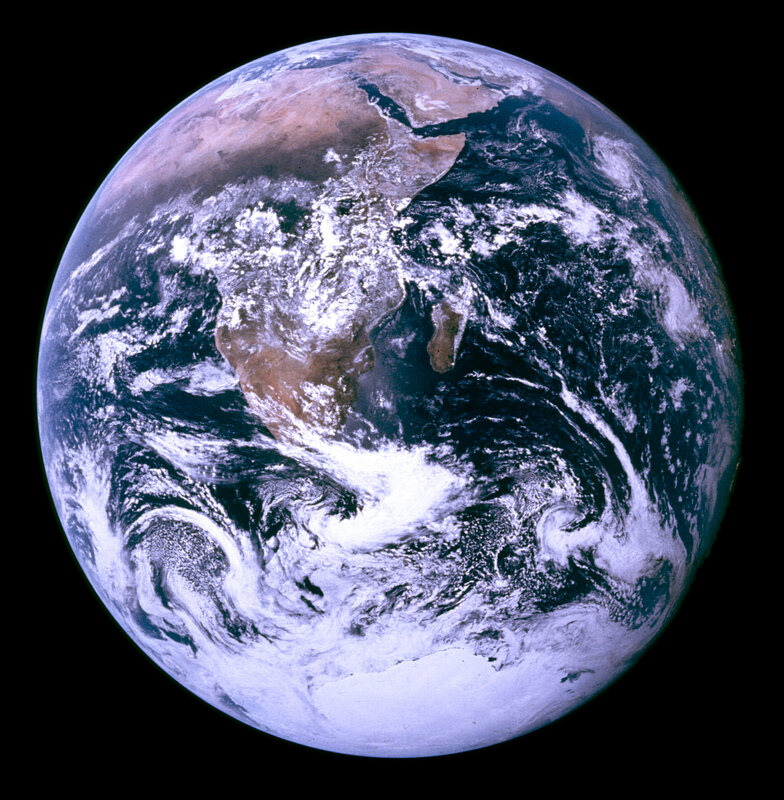 Know any planetary history? The beauty of history, to add to Juliana’s list, to me lies in its never-ending possibilities. It’s like finding an author you love and discovering they’ve written ten other novels all waiting to be read. Or falling in love with a band on their sixth album and delving through their back catalogue. There’s always something out there that you don’t know, something that you should know, a genre that you hadn’t even known existed. If we truly think that history is integral to humanity, then it must be the history of humanity that we aim for. This means being aware of the ways in which being aware of the ways in which different disciplines address the same questions that historians do and acknowledging that the political state is not always the correct viewpoint from which to pose a question. I hope you won’t think I am being too indulgent by highlighting a controversy over labor history that a friend of mine has found herself landed in. Judy Taylor painted a mural for the Department of Labor in the state of Maine. The paintings hang in the reception area of the department and depict the history of labor in the state. The paintings make explicit reference to a number of episodes in history, with a focus on laborers. The new governor of Maine, Paul LePage has decided to have the mural taken down for being one-sided. According to LePage, it is unfriendly to business and discourages cooperation: ‘History is about two sides. Like in a war’. You can see various press coverage of the controversy here, here and here. You can hear some radio coverage here. Apparently, business representatives have complained about being faced with the mural while sitting in reception. The controversy struck me as interesting and also very American. We really are a nation who likes to forget the past. No matter that Judy’s mural depicts an artistic interpretation of real history, we don’t like how it makes us feel so please let’s take it down. When asked what it would be replaced with, LePage’s spokesperson said ‘something neutral’. Is there anything neutral???? Maybe he means something that has nothing to do with labor history at all. Contrary to what LePage was trying to suggest, he is not offering to present ‘two sides’ but to be selective about the story that is told. Judy’s mural seems to have been construed as biased by presenting labor history from the laborer’s perspective. LePage’s objections do not remove the fact that child labor and strikes happened. Anyway, I just wanted to point it out because it seems to me to raise a lot of issues of interest to historians. Plus (and I may be biased) I think the paintings are great. Irish print culture and eighteenth century studies are soon to benefit from a fantastic Eighteenth Century Research Group (University of Limerick & Mary Immaculate College) digitization initiative. The project is two strands, the first to digitize the Magazine of Magazine’s, making it searchable and providing free access to the public. The Magazine of Magazines is a remarkable eighteenth-century miscellany which was written and published in Limerick (1751-1769) and which included literary and scientific reviews and information. The digitization is currently in process and the second strand consists of the creation of approximately 150 ‘interactive ebooks’ which will also have ‘informative annotations’ and that will not only be valuable for those studying the texts but will also be a useful teaching tool. This looks like it will be a fantastic resource when it is completed and will open up the intellectual life of Ireland and the eighteenth century for scholars of literary and scientific history. As Lisa has already highlighted, the academic job market is currently in full swing (or half swing, given the ‘e’ word). Applying for jobs tends to turn one cynical in the best of times. The process of composing cover letters that summarize years of one’s life in 500 words or less can be soul destroying. The type of self-representation which is required by those engaged in the academic job hunt tends to reinforce the distance between ‘professional’ historians and everyone else with an interest in history. With this in mind, I thought it might be good to get a discussion going as to why we do history since I think this represents common ground for everyone with an interest in the subject. I have given 5 reasons below and I hope others will add theirs in the comments section. 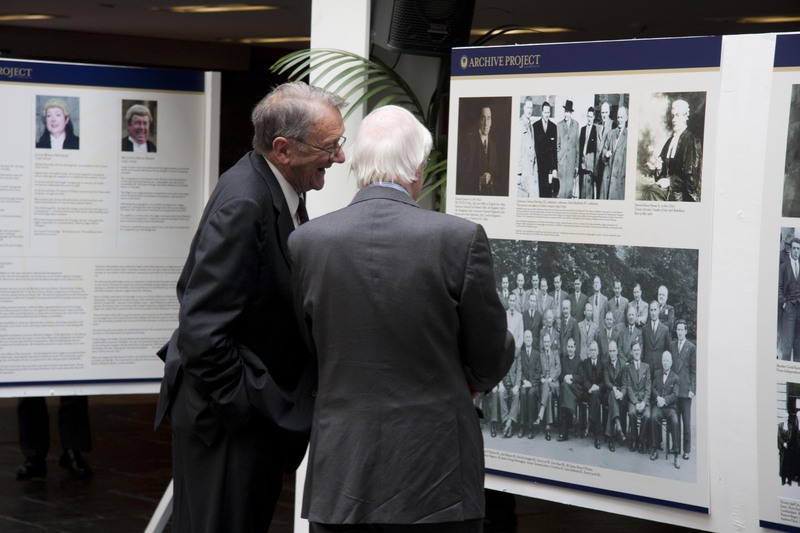 The Bar Council Archive of photographs, documents and related legal material, under the patronage of His Hon, Mr Justice Hugh Geoghegan, has been in place for four years, forming a collection of images and history of the legal profession. In an effort to expand our collection, we are getting in touch with other archives and people to see if they have relevant material that we could copy in digital form. We have been borrowing images, taking a digital photograph and returning them to the owners. We are hopeful that there may be further items in personal collections that would be of interest and would enable us to develop our archive. If you have an image or document that would be relevant, please contact Jeanne McDonagh at jmcdonagh AT lawlibrary DOT ie to discuss it. All help is greatly appreciated. When I was in high school there was nothing more powerful or desirable than the licensed driver with their own set of wheels. The most cherished phrase in the suburban American teenage vocabulary: ‘My dad said I can have the car tonight’. A car is freedom. 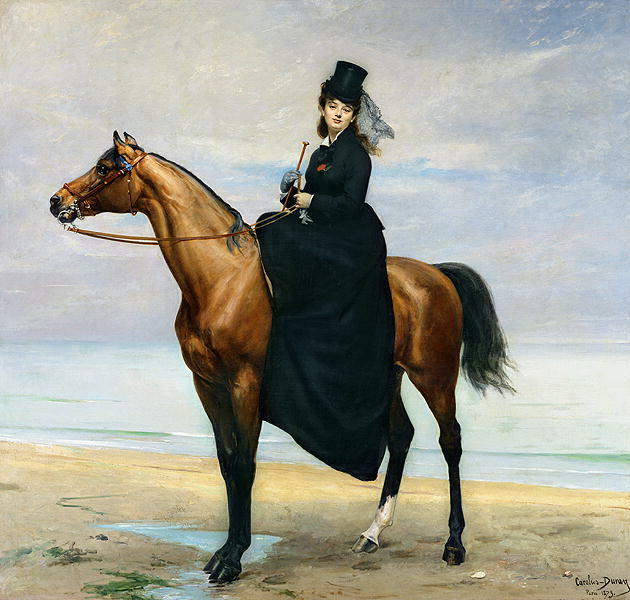 This understanding recently brought me to a somewhat surprising identification with one of my sources and his horse. JCK, as I will call him, was a lucky young man. He came from a wealthy Dublin family with a stable of four-footed vehicles at their command. JCK, an angsty student moping about town, often did his rounds on the back of a mare called Flora or a gelding called No Go. Sometimes he chased women, sometimes he rode aimlessly into the countryside and less often he did errands for his parents. My brother invited me along to Tutankamun: His Tomb and Treasures at the RDS last weekend. Considering his wife was away and we were on a family day out, I have two nieces 3 and 7, I was well aware I was there as much for reinforcements as for my interest in history. It is always great to see what type of things kids reaction to in exhibits and trips though so I was delighted to go along. I was a bit unsure about how I would find this exhibition. The artefacts on display are models of the original. 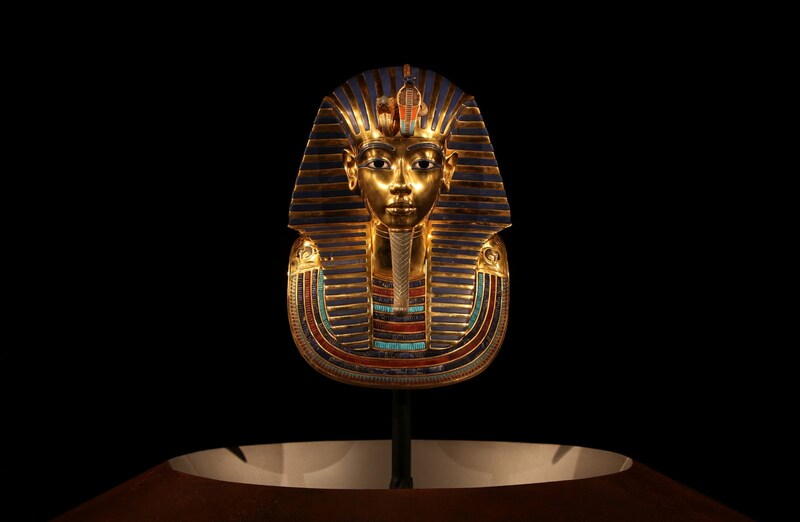 You are paying for the story of Tutankhamun and the discovery of his treasures rather then a chance to see the real thing. Because of this they exhibitors really had to set the tone well and tell the story of the tomb well. 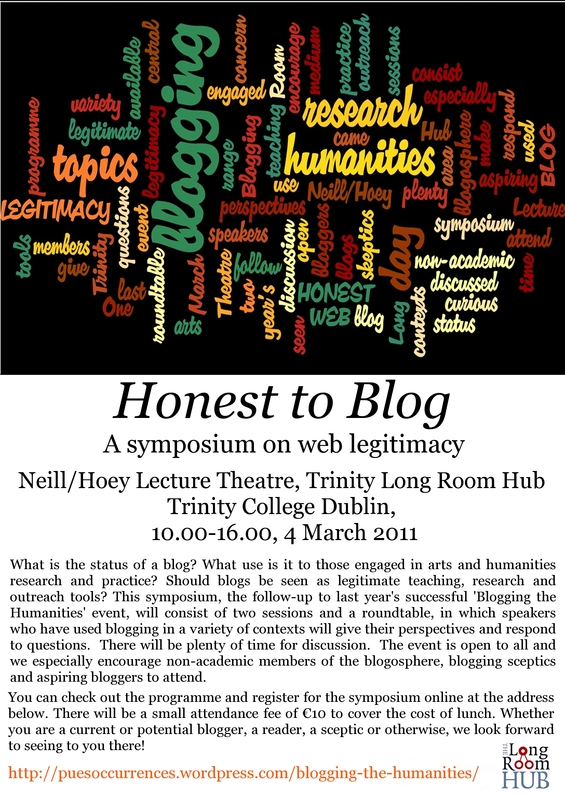 Last Friday, 4 March 2011, Pue’s Occurrences held its second symposium on blogging. This time around our focus was blogging and web legitimacy. At our first symposium an issue that was continually discussed was the problem bloggers have in ensuring their information is trusted and also in ensuring that blogs and blogging is considered a credible output. The core of this issue seems to be that the blogs do not get recognised as equal or comparable outputs to journal articles, essays, collections or books. When they are recognised there is a problem categorising them. Juliana Adelamn of Pue’s Occurrences hit on this during the final session, the afternoon was dedicated to a roundatable discussion where participants were asked to discuss ‘web legitimacy’. She said that recently the discussions have begun about whether or not blogging activities get put into academic reports of your progress. Forget Pancake Tuesday- Today is the 100th International Women’s Day. 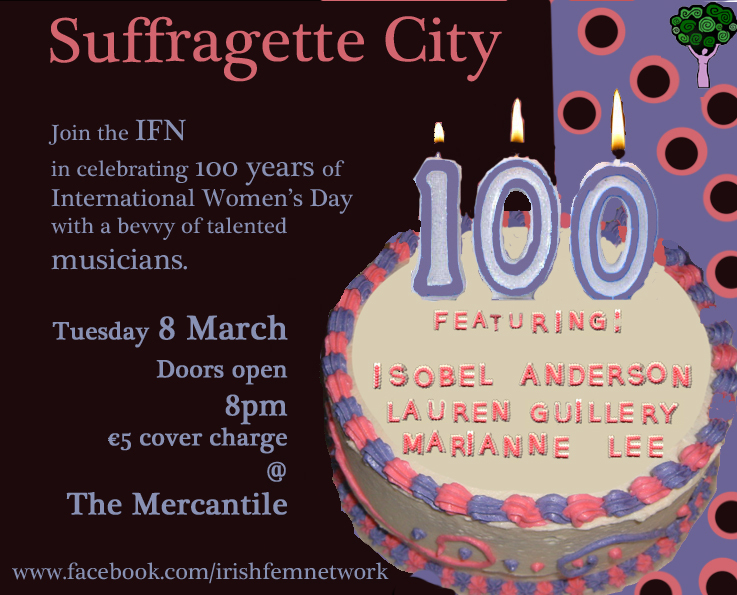 The Irish Feminist Network are celebrating by hosting a night in the Mercantile on Dame Street so if you are in Dublin get yourself down there. Looks like a good night! On Thursday, 10 March, Dr William Murphy is giving a paper entitled ‘Voteless, Alas; Women Suffragists and the 1911 census at Dublin City Library and Archives at 6.30. 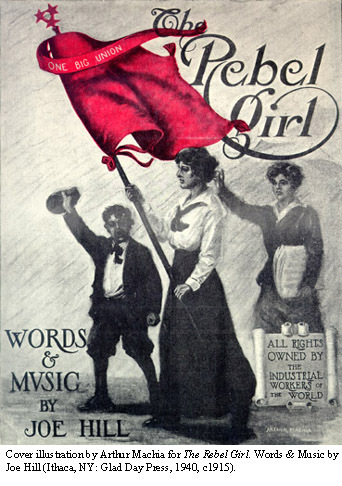 The event is free but the interested are advised to reserve a place by emailing: dublinpubliclibraries@dublincity.ie You can read about the history of the International Women’s Day here.